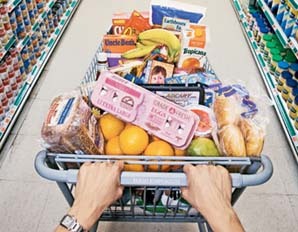 READER QUESTION: How much money can you expect to spend on groceries per month in Boston? It’s slightly difficult to answer this question with one number because what people buy, where they buy it, and when they buy it all plays into the equation. While our co-founders Mark and Kyle (who have lived in Boston) explained that you could get away with spending $100 per month, it may be a little difficult. Instead, we’ve put together some tips for you on how to find the cheapest alternatives and how you can limit your costs. From our experience, if you’re trying to limit your costs, you may want to choose grocery stores that don’t sell only organic products. While we aren’t hating on organic eating, if you’re a college student trying to live on a very strict budget, it may not be the most price-friendly option. We also suggest choosing stores that offer the best deals in their weekly circulars and coupons. While coupon clipping may not be something you considered before, it will save you a significant amount of money in the long-run. Some stores that offer some great deals include places like Stop and Shop, Shaw’s, and Market Basket (a chain of stories specific to Massachusetts and New Hampshire). Memberships to stores like Sam’s Club and BJ’s will also help you to save money. You can split the membership fee (only about $50 a year) with your roommates, and you can buy items like toilet paper, paper towels, and bottled water in bulk, which will help limit your costs when you go to the grocery store. Another way to limit your spending is by sharing the cost with a roommate. If each of you has your own carton of milk, it will end up taking up a lot of space in your fridge. Save space and money by splitting the cost of items like milk, eggs, and condiments that you can all share. You can save a lot of money by putting together a budget of what you want to spend each week. You will probably have to do shopping about once a week, especially if your buying items like fruit and vegetables, but you can break down those trips into 2 larger and 2 smaller trips each month. Every other week you can make a larger shopping trip where you stock up on nonperishable items (canned soups, canned vegetables) and other items that won’t spoil in 2 weeks. In between those trips, you can make a smaller weekly shopping trip and buy just perishables and other items you’ve run out of. You could easily set yourself a budget of about $25-30 during those smaller trips and $100 during those larger trips. This way your total for the month is about $250. You could even limit that further by buying store brand foods, and buying only the essentials. We hope this helped to answer your question. If you have any other questions or suggestions for any topics you would like us to cover on our blog, feel free to drop us a line at advice@jumpoffcampus.com!